Steve Fisher, Nottingham - I've owned some rubbish wheels. The photos on this page show that I have owned some very undesirable wheels in my time. I am posting this page as on a regular basis I get the line "didn't you own a ....... once" or "Remember the time we were in ....... and". So to jog memories and receive sympathetic nods of understanding the following images are presented. Like most estate kids of the Seventies we cut our biking teeth on old clapped out bikes, usually a Raleigh Runabout ( actually a Raleigh push about as they never ran well at the best of times, and given our non-existent mechanical skills they stood even less chance of running ). Occasionally an old British bike would appear, soon to be wreaked by no sympathy, no riding skills, no brakes, no fear and no oil. Eventually as we reached the legal age to ride, an assortment of better bikes began to appear. If your parents had a bit of money and could be talked into it you got a FSIE or Honda. If you had to buy it with your own money, you got a old Honda or Raleigh. Over the years the bikes got better ( sort of ). The list included: Raleigh Runabout, Raleigh Supermatic, Honda c50, Suzuki B120 ( written off inside a month ), Raleigh wisp, Suzuki GT125, Yamaha RD400e, Yamaha LC350, MZ150, Honda Express x 2, Honda 250RS and a few others. During this time I also ran several Reliant 3 wheelers ( Regal car, Regal Van x2 ( rolled one ) , Robin van ). When I passed my car test I owned a Lada, Toyota Cressida and a Toyota Carina. Then I went straight to owning company cars ( all Vauxhall ). As I was the Photographer of the group, this meant there are lots of photos of other people on bikes or with cars but very few of me. This is the reason for this being a fairly small summary of my machines. Below are photos of some of the bikes/ cars and some comments. 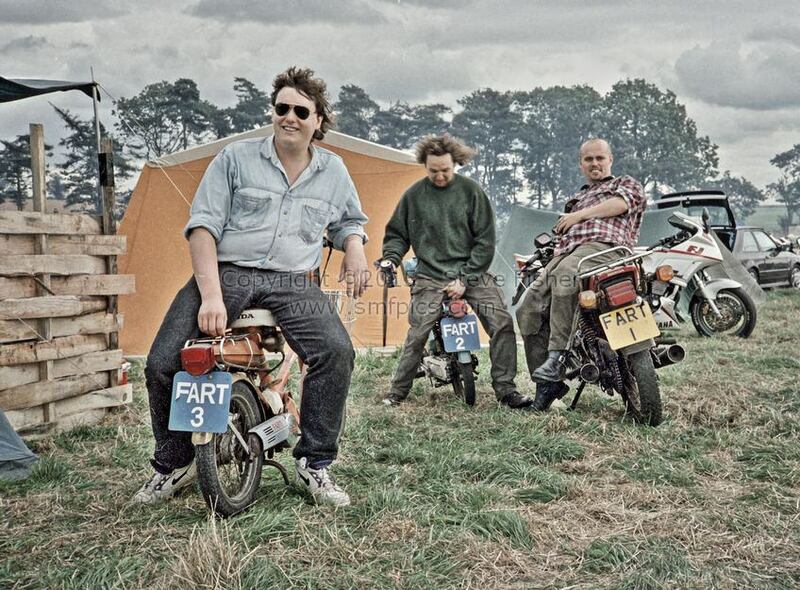 Unfortunately there are no photo's of the very early bikes. Yes, Its a Raleigh Wisp. At the time I was working shifts and needed a cheap method of transport ( it was also good exercise, as it could barely climb the hill into Nottingham and needed the pedals to be used if I was running late). 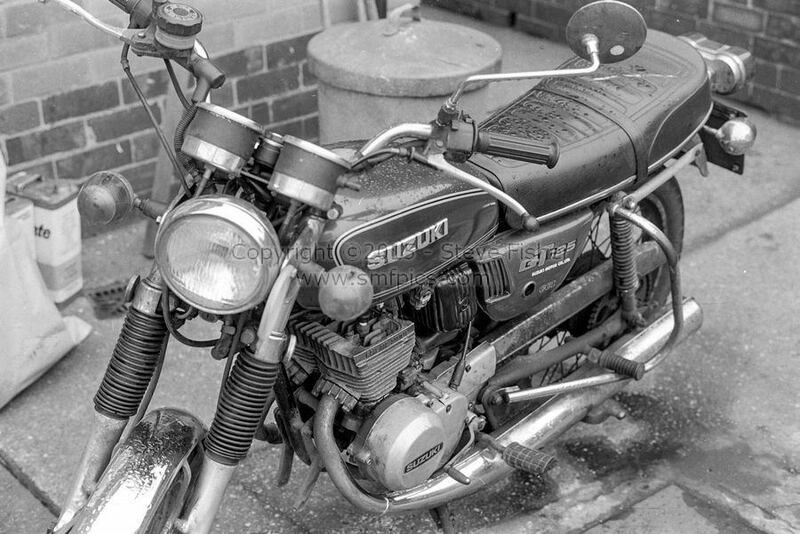 Next was a Suzuki GT125A, I travelled a lot on this, it honed my mechanical skills on this bike, setting timing, changing cranks and working on carbs. I was into bike racing ( going to the Silverstone each year ), having got friendly with a racer at work and went to many meetings with him and took photos. This made me decide to try my hand at racing. 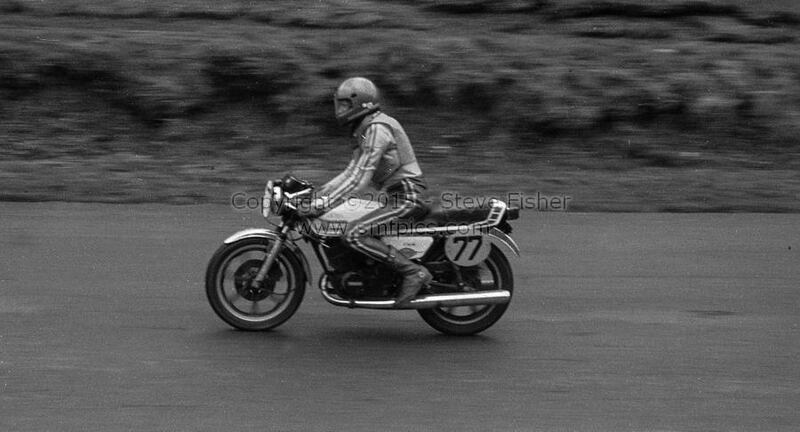 To see if I could even get round a track, me and some of the guys in my shift went to Cadwell Park, paid the fee and took the GT125 onto the track ( it still had its crash bars fitted! ). 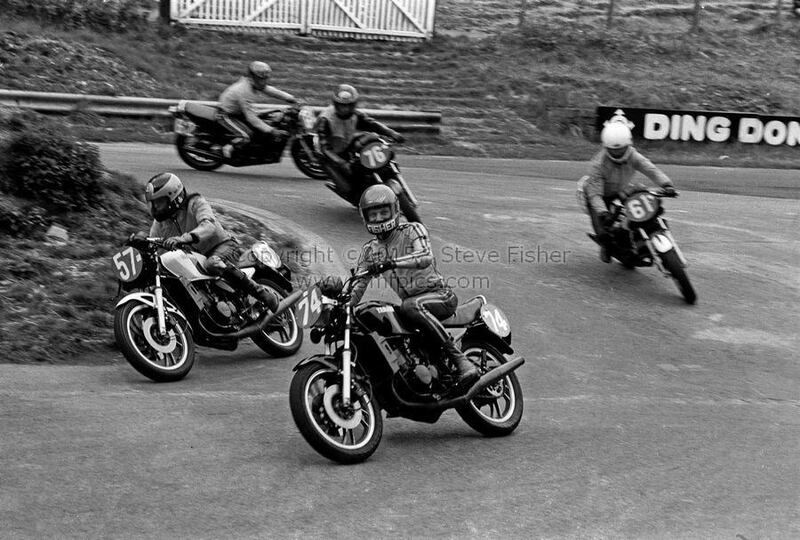 Several guys from the shift had a go and we found out the following: that I could lap a track, A GT125 was slow, it liked to pogo round the corners and there were even worse riders out there. It least we didn't crash the GT125. I think this is the photo of the RD400e that I was eventually to race, this was taken as it was being run-in on a ride to Snetterton. It would never look that good again. 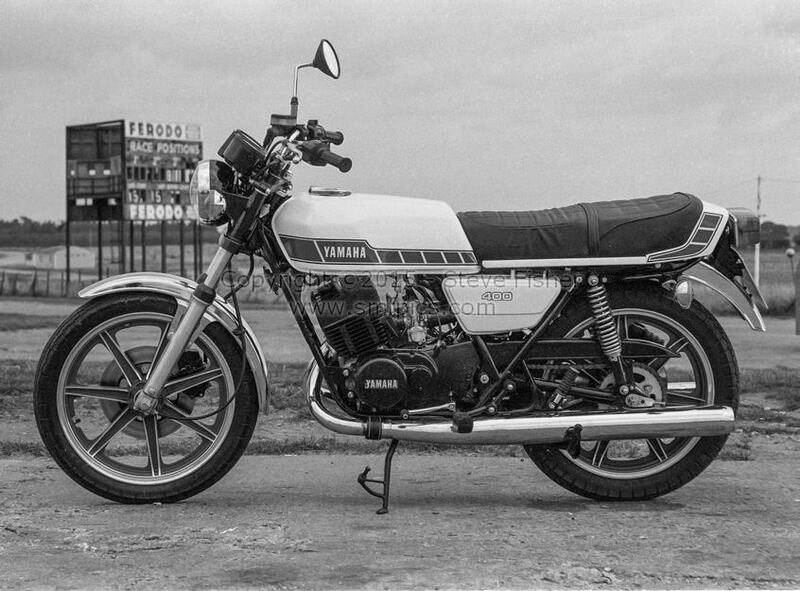 I bought the RD400 off Andy, it was a winning bike. The idea was I knew the bike was fast enough, but was I. The simple answer was I was not talented enough. On a good day I would be in the top six, but I could never attack from the start I always took a lap to settle down, and then start racing. Unfortunately this is not a good idea in a six lap race ( as most club races are ). 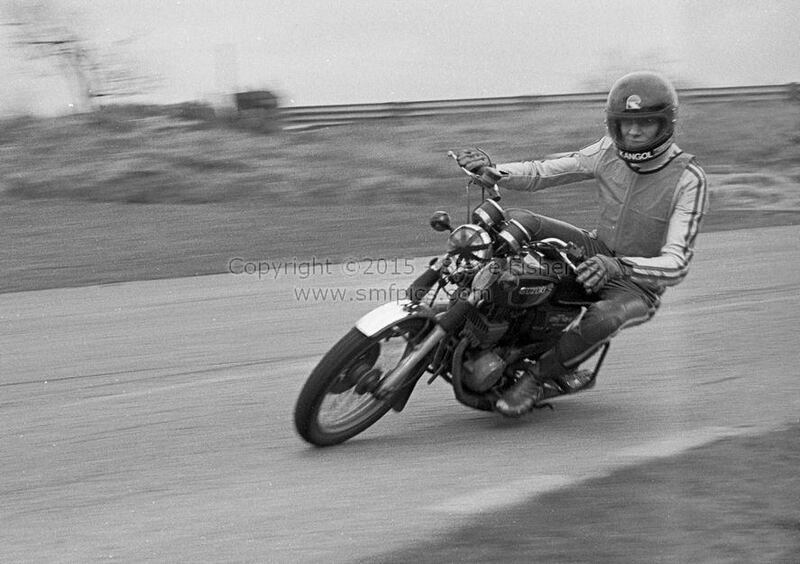 I think this photo is from my first test day on the new bike. 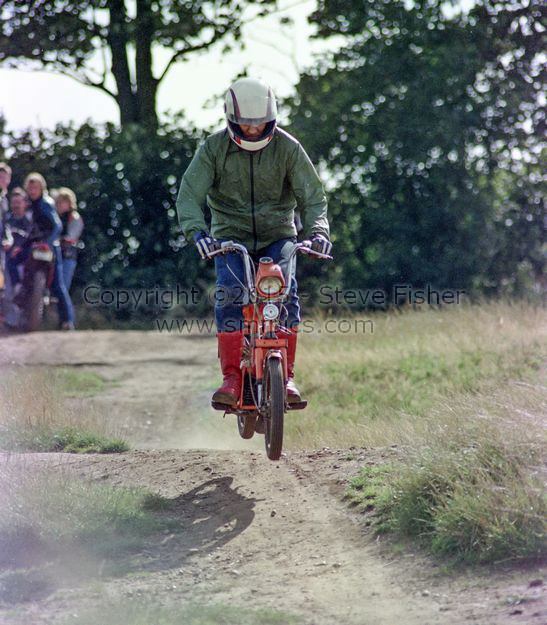 One of the problems I had was I was tall and relatively heavy for these small bikes, which resulted in ground clearance problems. Not good on a RD400 as the exhaust would ground and throw you off. Which I found out a few times. Another photo from my first day on the bike. My Riding style / technique did improve. 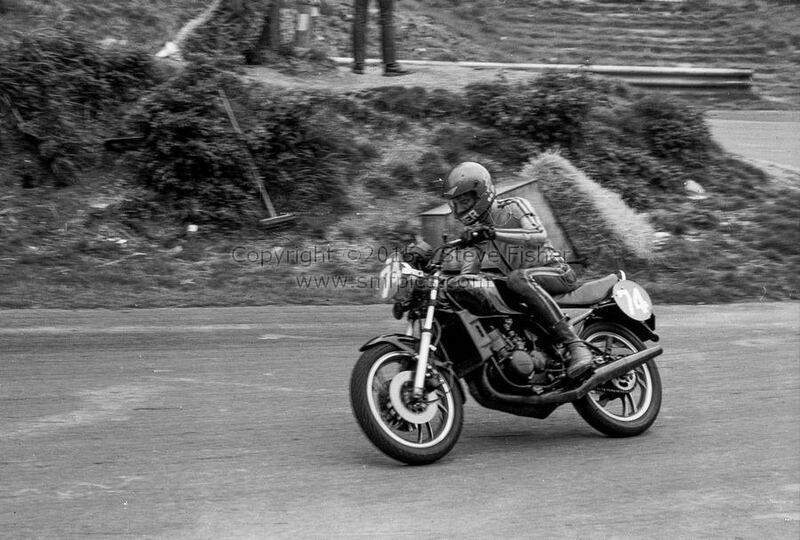 By the End of 1981, it was obvious that the RD400 was becoming uncompetitive ( unless you were a very talented rider ). So I bought a brand new LC350, as it took all the money I had, So I had to race it untuned. This was not as bad as it sounded as I could corner a lot better on the LC and was not that much slower down the straights on the smaller circuits we raced on. I was just about always in the top half of the field and really enjoying the racing. We even did a 6 hour endurance race on the bike. I may have been successful if I had taken the racing more seriously! I did get my head down when I needed to. However It did not end well. 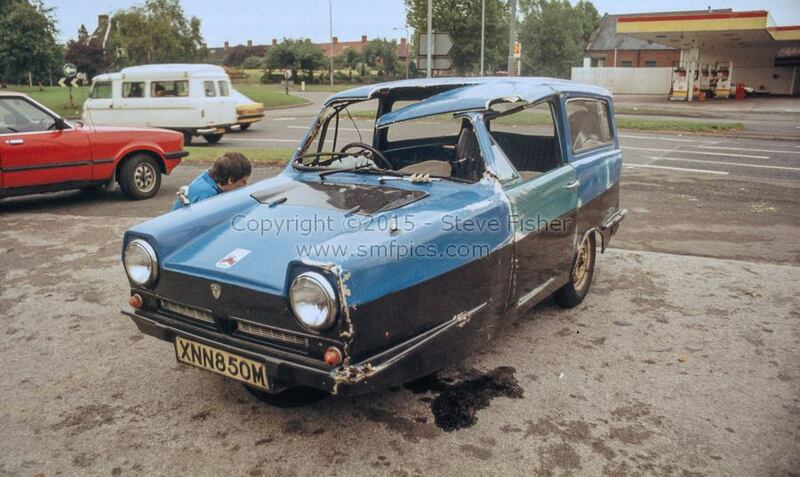 In late 1982 I had a big crash at Donnington, which was effectively the end of my racing career. It would not have been too bad, but I crashed after the race had ended and had already crossed the finishing line! After I got out of hospital I needed transport. A MZ150 was found cheap, it worked ( just ), and got me around for a while. I did discover that if you tried to pull a monster wheelie on the MZ its exhaust would hit the ground behind you and throw you off to one side. As the girlfriend was getting fed up with getting wet on a bike we then started looking at 3 wheelers. The MZ was put in a garage and forgot about, somebody then stole it. I worked on the principal that if you are desperate enough to steal an MZ�you need it more than me. We did have a spare rolling chassis, so we did what you would naturally do, we put it on a bonfire on November the 5th and burnt it. 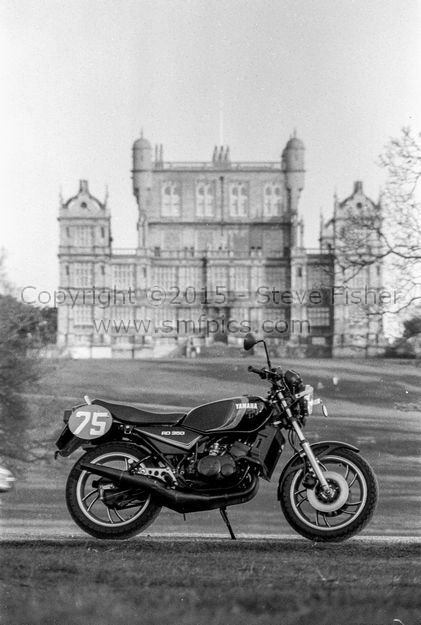 As an aside, does anyone remember when the major motorcycle manufactures used to hire a race circuit for the day and invite riders to 'test ride' their latest bikes. 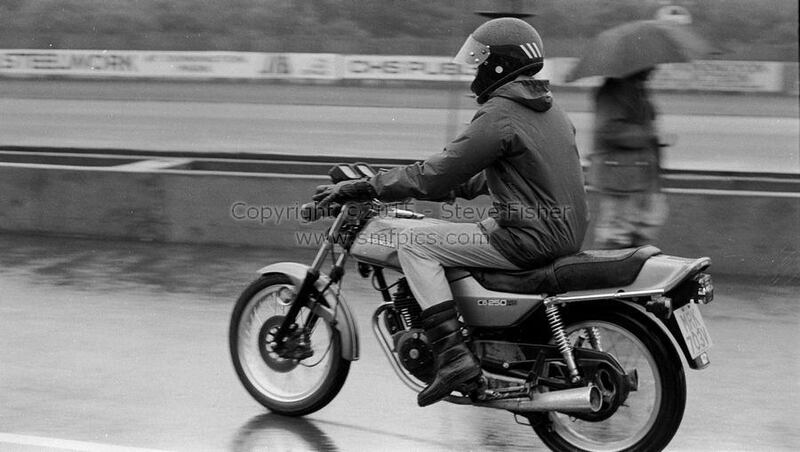 This photo is taken at a very wet Donnington Honda day. There used to be a marshal on a bike in front to control the pace and a Marshall on a bike at the back to help with any problems as a group of about 20 - 25 riders went out on many different bikes. I used to make sure I was last to leave the pits and go slow while adjusting myself to the bike ( actually just making sure there was a big gap in front of me so I could really give the bike some stick ). It nearly backfired on this 250RS as just about flat out through the old hairpin the backend broke away into a massive power slide. I think the marshal following me was more shocked than me, to see the bike going sideways with almost full lock on the bars. After that I took things a bit easier. 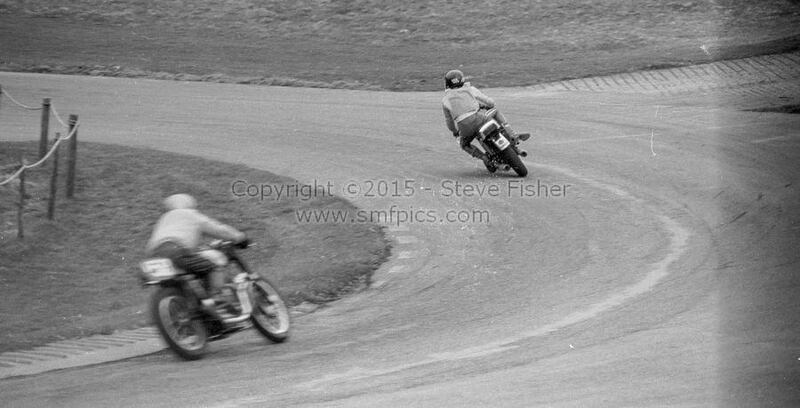 Unlike at a Yamaha day at Donnington. 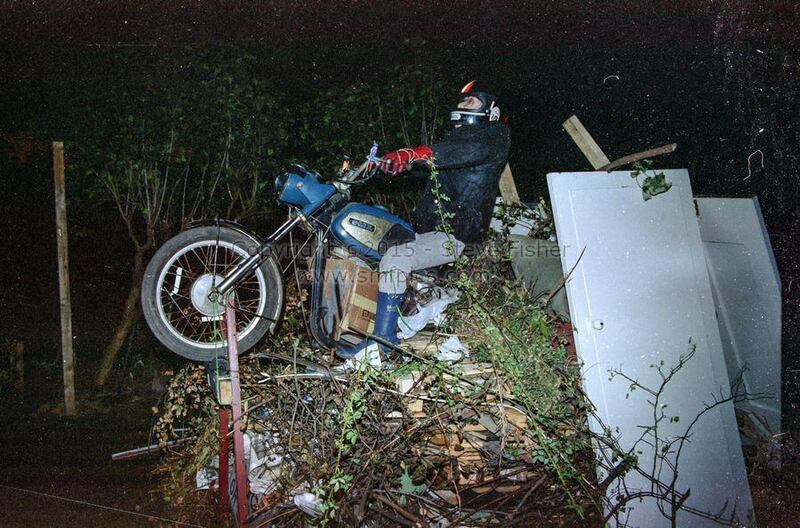 On that day the queues for the new bike were huge, I managed a ride on a TR1, all popping and banging on the overrun and no ground clearance ( other riders behind me that the sparks were impressive ). I also tried a XT250, no power, no brakes, Knobbles and no end of fun. It was amazing to be out-braking people and overtaking them when they were on much better bikes. I also got told off for trying the scooters on the learner�s course, I was going round and flipping the scooter from side to side on the slalom course and grinding away the footboards. 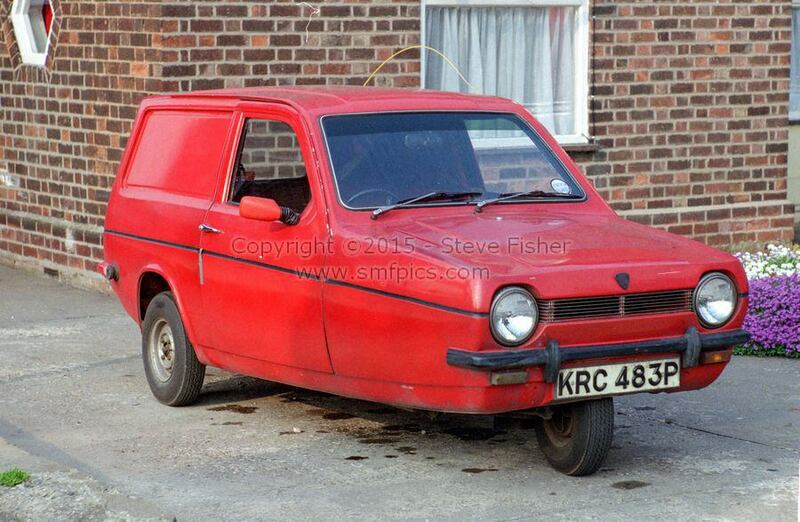 Yes, I owned a Reliant ( well several actually ), know all the nicknames (13amp plug, Plastic Pig, Refs Whistle, jelly mould, Death trap ). I drove all over the county, used them to tow bikes to events and had no pride. One was even called the black death, as the previous owned had hand painted it black with industrial strength paint and, it appears, a yard brush. But at least the brush strokes went from the front to the back, no doubt to improve the aerodynamics. Of course I rolled one, if you have an hour of your time and a few drinking vouchers you can hear the full story of the before, during and after of this event. It was like a surreal David Lynch meets Peter Kay TV show. Eventually I upgraded to a Robin, could the world get any better. At about this time I convinced a couple of mates to enter a Moped mayhem race with me. We would use one of the two Honda Express I had for the race. 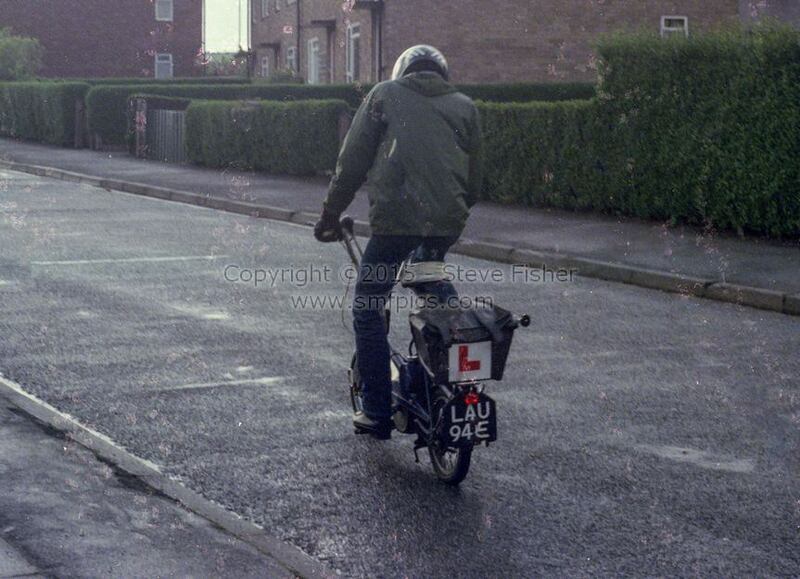 This was the Honda Express I had riden from Nottingham to Brixham, Devon and back for a bet. Another story that best told over a few drinks. The photo is of me testing the bike before the event, we didn�t know what to expect so we tested all possible options. The Moped Mayhem event was at a transport cafe in Doncaster. While testing the bike out on a dirt road by the cafe 2 guys in official looking uniforms came and gave us a bollocking. It was because we were on a service road outside a prison! Yep just behind the cafe was a prison. Many stories from this event, there is an 8mm film of it somewhere. Eventually I was told I really needed to have a full car licence if I wanted to get on in my job. So I passed the test ( only had 5 driving lessons , and that was only to get a good car to do the test in ). As I had been driving a 3 wheeler for several years and never taken a lesson, the test was more to prove I had not picked up to many bad Habits. To Celebrate I bought a Lada. This is a great car to really wind people up, 1st gear is very low, and 2nd gear is low. This, along with the rear wheel drive, meant traffic light starts were surprisingly quick. I used to sit on the inside lane at traffic lights then enjoy sprinting away when the lights changed. I would then ease off at 30mph, just slip into 4th and cruise on at 30mph. However, if the other car was a better make ( basically anything ) they would put the pedal to the metal. In most Front wheel drive cars, this resulted in wheel spin or if they had a long 1st gear a slow take-off. Either way I had beaten them away from the lights and they knew it, of course the other driver just kept their foot down and disappeared up the road. 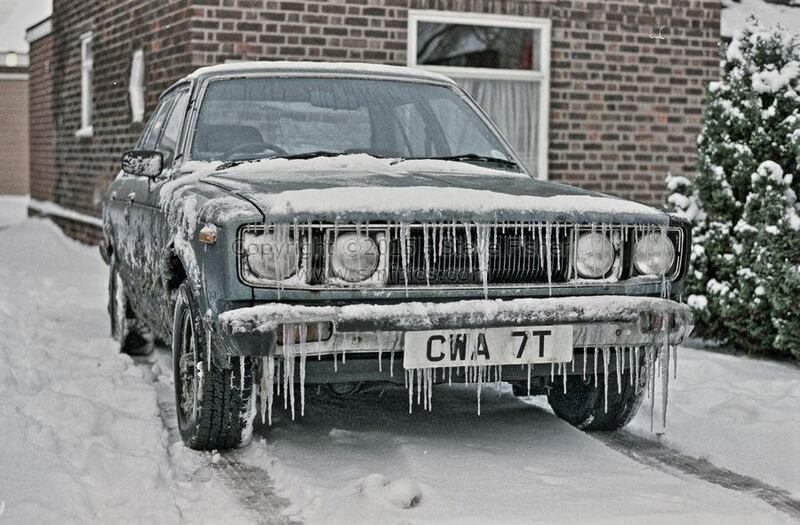 Pushing the envelope was the norm for me with the Lada. After the poor cornering performance of the 3 wheeler, I tended to slide the Lada everywhere both on the brakes and through bends. At one stage I managed to get through a set of tyres in 5000 miles. 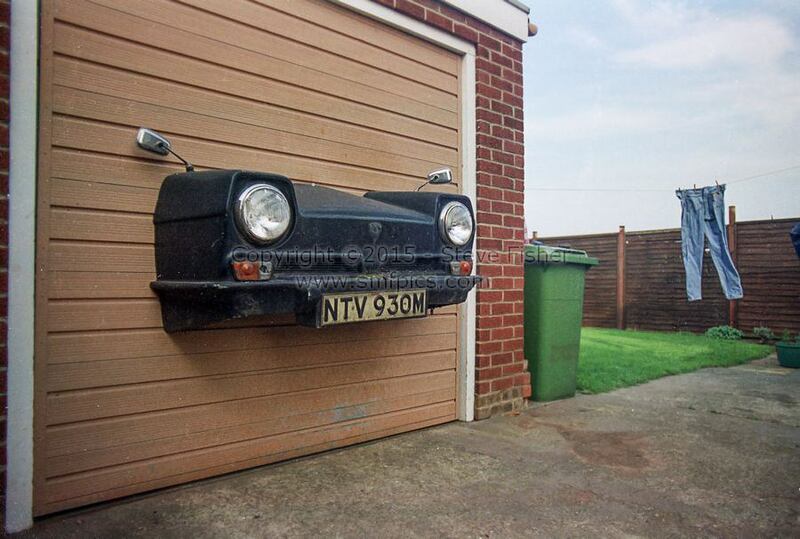 When the Lada failed its MOT because of Rust. 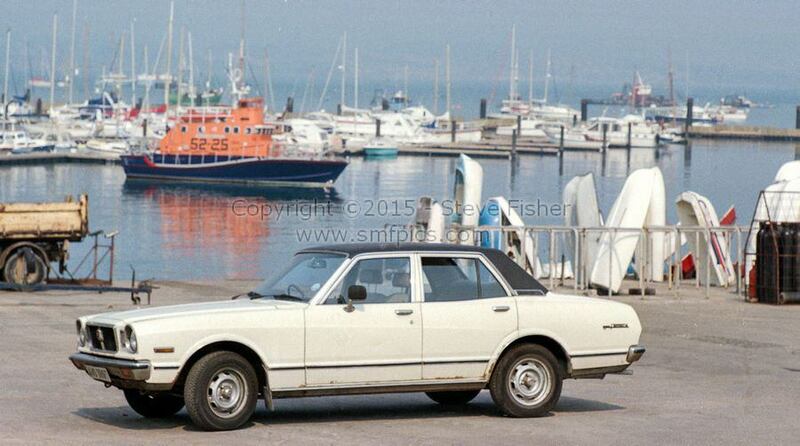 I had to buy another car, it was a Toyota Cressida. Bigger, faster and more comfortable than the Lada (no vinyl Seats to try and give you 3rd degree burns in hot weather). Had many adventures in this car, including doing a 70MPH handbrake stop (Its very bumpy to drive a car with very flat spotted tyres). When the Cressida failed its MOT because of Rust we had 'the last night of the Cressida adventure', by the time I arrived at the scrap yard the next day the car was about 100lbs lighter and not driving quite straight. There are many stories about adventures with this Car, again its a few drinks and an hour or two to regale you with them.